I am fortunate to work in a dynamic and creative school. A school that is passionate about delivering a balanced education for the students in its care. Challenging students academically, within the arts, physically and, to become environmental citizens of the future. A school that expects teachers and students to be reflective, critical and resilient. So, when my Head suggested we pilot Student Led Conferences I was willing to see how it could be implemented across KS2. Reading and understanding current pedagogy and published school examples of Student Led interviews was my first point of reference. I read extensively, viewed clips and discussed with colleagues the pedagogy of students leading their learning. I used this information to engage in robust dialogue about the best way forward. Incorporating my colleagues professional ideas and years of experience to the researched information, developing a model we felt was suitable for our students and the school. 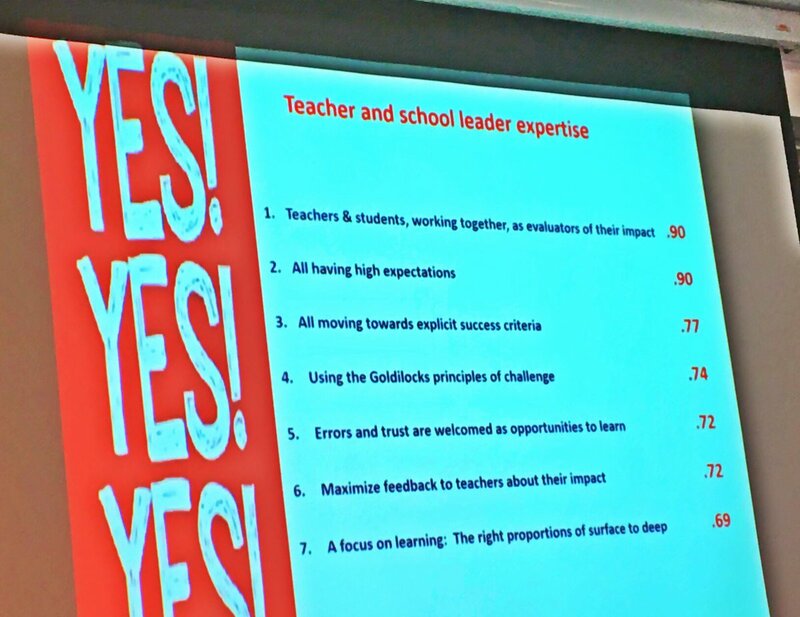 Prior to the first meeting, I shared with the team links to the research on current pedagogy about Student Led Interviews. Acutely aware that time is a precious resource for dedicated teachers; I did not want to waste it during the meeting reading material. In addition, I wanted the team to be on the same page, with the ability to think critically. The agenda was set and shared with the team before the meeting; another strategy I felt would maximize discussion time. During the first meeting, the team reviewed the research and engaged in professional discussions. Important information was documented in the minutes as well as next steps to be completed prior to subsequent meetings. This cycle was repeated over several weeks until final decisions were implemented about Student Led Interviews. The team was responsive and motivated with a common shared goal of preparing for the Student Led interviews. Throughout the weeks of preparation for the Student Led interviews, I allocated time to review the process and make some adjustments, most of them to do with the organisational aspect for the event. The team were on target preparing the students by selecting activities and tasks, rehearsing the script. There was trust. However, it wasn’t until close to the date of the Student Led interviews, that I realized there was something I had fundamentally missed. Despite the school’s expectation being one that its students are reflective and critical, these year groups did not have a culture of reflection of learning in their classroom. The lack of continuous reflective practice inhibited the students from deeply sharing their learning journey with their parents. The students scratched the surface, shared their ‘activities’ spoke about how much they liked the ‘task’. A culture of this calibre must be established from day one, week 1, term 1 and continue to evolve and develop throughout the year. A big red flag. How could it be addressed? I took the time to review and analyse, listen to feedback from parents, students, staff, senior management, and my own overly critical self. I took a lot of time (it is now August and we held the interviews in February!) I wrote my thoughts down, read more articles and research, then pondered what could possibly be the best way forward. I felt that preparation for Student Led Interviews (with depth) had to start in Week 0 of the new academic year if we want it to be a truly reflective Student Led interview. Set clear guidelines for consistency across KS2, work collaboratively with 5/6 Phase Leader to establish them. Possible guidelines: highlight own experiences and call on staff to share when they have created situations where both teacher and student are working together as evaluators of their impact, staff to regularly review school’s marking and feedback policy – use weekly year group meeting to highlight sections that focus on critical reflection from students and feedback from teacher, students post one high quality Seesaw reflection a week (provide students with scaffold of sentence starters if required), provide staff with a list of key questions to ask students to help them reflect on their learning, follow the LAUNCH cycle using success criteria. Phase leaders use additional release time to visit classrooms and talk to students about their learning. Share with staff articles and clips about students reflecting on their learning. Work collaboratively with Seesaw and LAUNCH Leaders to reinforce a culture of student reflection. Cycle information about student reflection during weekly year group meetings. Ensure the goal is clearly stated and fully understood. Reading and discussion may not be enough, monitoring during the preparation stages, using the final goal as the success criteria is also vital. Adjust and make amendments along the way. Hold ‘trial’ sessions after the exemplars. Regularly communicate with Phase Leaders of the team members. Return to the core/center/heartbeat of what you are aiming to achieve. For the past 7 days, I have been fortunate to spend time on the South Coast of Australia. Four out of the seven days were with my own family and my extended family. The time we spent together was incalculable. Endless days together that required minimal planning or decision making. Albeit, planning meals and if we should take the long or short road to the beach. Rejuvenate the mind, body and soul at the end of a term. Create space for new ideas and projects. Today’s post is a set of questions. For those who read my blog you are welcome to answer in the comment box. If you could only keep one book, what would it be? Finally, Saturday had arrived. The day I wake without an alarm, the day I savour the morning coffee, the day that is mine to run. Upstairs, the house is silent, it will remain that way for a while longer. I walk downstairs into the kitchen, where, the hum of the fan gently circulates air and invites me to brew the first coffee of the day. While my hands routinely prepare the coffee, I mull over the previous night’s dream, slightly annoyed with its persistent lingering. Does it have a deeper message? My thoughts are interrupted by the buzzing of the coffee machine; the dream can be unpacked later. Taking my first sip of coffee, I savour its piquant flavour. Thankfully, it’s a good batch. Returning the cup to the bench, I open my Twitter feed, what have I missed this week, what speaks to me? @gcouros has a message that resonates, note to self, implement this immediately. Next up, is Jennifer Gonzalez @cultofpedagogy Overwhelmed? Do 5 things, an entertaining way of how to start with 5 simple things to do to regroup. Jennifer shows us her kitchen bench. I glance over at mine – it looks frighteningly similar to the image of her bench. Perhaps a task to tackle before Sunday night. The coffee continues to work its magic. I can already feel the week’s activities dissolving and Saturday serenity creeping in. Perhaps the dream analysis can wait until my afternoon walk in the rainforest. A quick post to share my next steps towards establishing this blog. To assist with writing my posts, I have decided to participate in the Slice of Life writing Individual Challenge #SOL18. For the month of March, participants write daily about an event in their life and comment on three posts. I am looking forward to the challenge and the feedback from other participants. Sitting across the desk from a colleague during our regular what’s happening meeting, I received a gentle reminder about my professional targets. Had I started the leadership blog? Well.. no, excuses, more excuses and then a note to self that the excuse of not having a suitable name was no longer acceptable and it was simply time to write. Having a vague recollection that I had trawled Twitter sometime in September 2017 to find the top 10 leadership blogs. I returned to my original search @Teacher Toolkit where a regular stream of professional reading and resources are at your fingertips. Re-reading the post, Top 10 Education blogs in the U.K, then following the link to top tips, inspired me to work through the uneasy feeling of getting started, follow the guidelines and begin to write. Tip one, choose a platform. Easy, a colleague had recommended WordPress. Tick. Tip two, make the blog personal, so far so good. Tick. Tip three, word limit 1,500. Have that covered. Tip four +, follow a format similar to Neil Patel. This one, a work in progress. Initial thoughts from a novice blogger. The effective leaders that I have had the privilege of working with over the duration of my career have all had something in common; a strong vision, based on current pedagogy and strength of character. From my humble beginnings as an NQT to now, as a not so NQT, you just know when you’ve got an effective leader at the helm. My goal in writing this blog is to begin a personal reflection of my leadership, learning from the not so good experiences, celebrating and sharing the success. I plan to come back to that feeling you get when things are uncomfortable, remind myself of my vision and believe in my strength of character. To inspire young minds to explore endless possibilities and inspire wise minds to consider new possibilities. So, here it is, my first post. More to come.